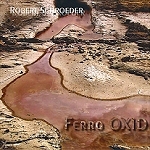 Spheric Music – Robert Schroeder new CD “Ferro Oxid” – Chain D.L.K. Do you think Robert Schroeder is not able to produce new sounds? Well this new album is proving the opposite. Robert has discovered several new exciting sounds and managed to make interesting new compositions. Surely you will find some few Chill Out / Lounge influences. But these are restricted to some soft beats and grooves that are relaxing in the background. In the foreground you will realize dreamy, new bizarr sounds, spacey effects, deep far strings and choir sounds and distinct Berlin School sequences. A blend that gives you an extraordinary listening pleasure. Sometimes you feel like being on a trip through an unreal dream-landscape. At another time you feel directly transported into the cosmos. The deep choirs and spacey effects evoke bizarr-floating sound spaces. grooves or pearling, sometimes driving sequences. Robert selected special sound colours of various synthesizers and also created a bombastic sound on the whole. Along with SphereWare and Cream this is one of his best releases for years!